Get tips on how to care for your Ugg boots. Caring for and cleaning of sheepskin boots is critical if you plan to wear them in inclement weather. The key to preserving your favorite sheepskin boots is prevention. 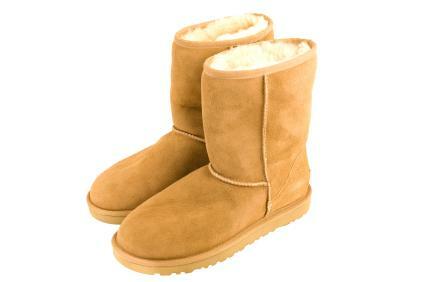 Most sheepskin boots, including mega-popular Ugg boots, are not waterproof. However, they are water resistant, which means they can tolerate small amounts of rain and snow without suffering severe damage. If you plan to wear sheepskin boots in bad weather it's a good idea to treat them with a water and stain repellent prior to venturing outdoors. Spray-on water repellent is available in most shoe stores. However, it is wise to read the fine print on the bottle before applying the spray to your boots. Some sheepskin boots, such as Uggs, warn against using generic water-repellent spray, as it may cause discoloration. Once you find a reputable water repellent product for sheepskin boots, simply spray your footwear in a well-ventilated area and allow them to dry completely before wearing them outside. Waterproofing your sheepskin boots will help protect them from getting soggy and soiled. Caring for and cleaning of sheepskin boots prolongs the life of your favorite winter kicks. Given the exceptional style and comfort of sheepskin boots, you would be remiss if you didn't learn how to care for them properly. Find a spray bottle and a soft cloth, to spot treat your boots. Never place your sheepskin boots in the washing machine. Moisten the entire surface of your sheepskin boots. Choose a cleaning and conditioning product that is safe for sheepskin. Ugg makes a reputable product. In addition, there are several generic sheepskin cleaners on the market. Dilute the cleaner with water. In a bowl mix one-half water and one-half cleaning product. Apply a small amount of the diluted cleaner to a clean, damp cloth. Do not apply the cleaner directly to your boots, as this could cause spotting. Gently rub your sheepskin boots, making sure not to scrub too hard. Rinse the surface area with clean, cool water, making sure not to soak the boot through. Place your boots in a well-ventilated area to dry. Do not dry your sheepskin boots with a blow dryer or expose them to direct sunlight. Lightly stuff your boots with newspaper to help hold their shape. When your boots are dry, gently brush them with a soft suede brush making sure to move in one direction in order to restore the sheepskin's natural luster. Grease stains: To remove a grease stain from your sheepskin boots, use a razor blade or sharp knife to carefully scrape white chalk over the stain. Allow the chalk to absorb the grease. When the stain has lifted, gently brush away the excess chalk and blot the affected area with a clean cloth. Repeat until the stain is gone. Stubborn stains: For extremely tough synthetic stains, you can gently rub your sheepskin boots with sandpaper. However, be aware that this method may compromise the color of your boots. If you notice water spots on your sheepskin boots, fold the footwear onto itself and gently rub the stained sheepskin against the clean sheepskin. This method is best used for minor spotting. To remove unwanted odors from your sheepskin boots, mix two teaspoons of baking soda and two teaspoons of corn starch. Apply the dry mixture to the interior of your boots and shake gently. Let the mixture stand overnight. Then, shake out the excess the next day.